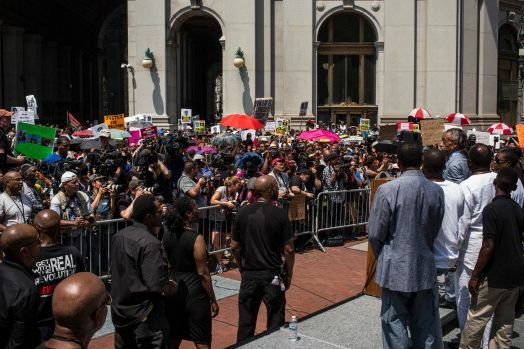 The rally continued at One Police Plaza, where Sharpton, Fulton, Martin’s brother Jahvaris, and hundreds of protesters were joined by Beyoncé (who on Friday encouraged her fans to sign a petition in support of Martin) and Jay-Z. (Supporters reportedly shouted, “No concerts in Florida!” to the couple as they walked by.) New York mayoral candidates Bill Thompson and Bill de Blasio also showed up for portions of the protest, as did comptroller hopefuls Eliot Spitzer and Scott Stringer. Update: Meanwhile, Martin’s father, Tracy, appeared at a vigil in Miami. His statements were similar to those his ex-wife gave in New York: “I vowed to Trayvon, when he was lying in his casket, that I would use every ounce of energy in my body to seek justice for him. I will fight for Trayvon until the day I die. 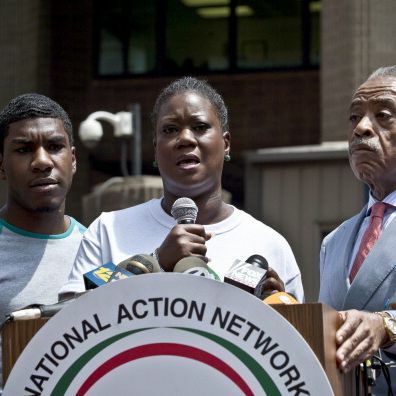 Not only will I fight for Trayvon, I will fight for your child as well,” he said.